Million Dollar Secrets - Investing in Real Estate! If I sound excited please excuse me...because I am! I recently stumbled onto an amazing, "anybody can do it", plan for building wealth with real estate investing! Stick with me for just 3-minutes, cause this is something you've never heard of. It's different and exciting! It's a mind-blowing real estate investing system for anyone with a busy life and a limited amount of time to spend acquiring and managing rental property. Low risk - Big profits. Every small real estate investor is looking for bargain priced rental homes in good neighborhoods that will climb in value. Get this! How about properties so good you have renters falling over themselves to get into your properties? Hey, if you answered anything but yes, take two aspirin and apply for a job at the post office! This amazing real estate investing system guides you into finding beautiful, profit producing rental homes in prime neighborhoods. Plus - you'll spend very little time finding them and you'll will buy them with little or nothing down! Yes, sometimes even no money down! Let me say that again - "very little time - very little money!" Gentle reader, I've studied every real estate book/course issued in the last 20-years and I've never found a real estate investing system that is this quick and easy! It's the easiest system ever! Most real estate investing courses stress no-money-down, finding distressed sellers, buying at 30% or more below market value. Oh sure, those are great ideas, but it will take you months and months, and maybe you'll find just one property like that! That's god-awful, dreary work! 99 out of 100 people get discouraged and give-up before they have even one rental. A plan where most people fail is nothing but a heartbreaker! But keep the faith! I'm about to reveal my truly amazing profit building concept. Real estate investing so simple you just can't help but be a winner! "What's the Magic? Just Buy Homes!" The true secret of real estate investing success for us little guys is to buy homes! That's all! Just get out and buy rental homes on reasonable terms. Then collect the rent and watch the homes grow in value, while the renters make the mortgage payments. Did you get that? The renter buys the home for you! Man, that's about as cool as it gets! You can buy three or four sensibly priced houses during the time those other poor souls are out chasing those near impossible deals. When you own rental homes you just get a little richer every minute of every day. You make money even when you're sleeping! Find great rental homes quickly! I'll reveal how you can find a profitable rental home in 7-days or less with this system. Remember, the secret to real estate investing success is to own 5 to 10 good homes and let renters make you rich. The sooner you own them, the faster your wealth grows. You'll learn how to select the home with the most money profit value. This alone will guide you towards making thousands of extra dollars with each property you buy. Choices are easy with this formula. Yes, I'll explain why tenants will jump through hoops to live in your homes. You'll spend less time and money marketing your rentals, and you'll be able to choose from the cream of the crop of renters. Good tenants stay for longer periods, pay their rent on time and take good care of your property. Have you heard landlord/renter horror stories? Believe me when I tell you I just don't have those problems with my properties and I explain why in "The Best Real Estate Investment Nobody Knows About!" You'll laugh at maintenance costs. I'll show you how to eliminate 98% of your maintenance responsibility. This secret will be powerful protection for your real estate investment cash flow. "You Don't Need a Bag of Money!" Are you wondering how much cash you'll need with this real estate investing system? I love that question! You better sit down before I explain you often can buy these homes with from no money down to as little as a 3% down payment! Think about that for a minute! You will own rental homes your friends will envy! Beautiful rental homes in attractive neighborhoods. Safe and rewarding investments that will just keep growing in value. And you can do it in your spare-time with almost no cash! Yes, some of that rent you receive every month can go into your pocket for spending. The longer you own the homes the more your spendable cash flow will grow each month! Here's another important consideration. You may have a large portion of your investment money in an IRA or other retirement account. That's putting all of your eggs in one basket. For your own financial safety you must have diversification. Real Estate investing is great for that and this is the perfect, no hassle plan that will work for anyone. Quick and easy! "Complete, Easy to Follow Plan!" You will learn everything you need in this ground-breaking manual. It will be your step-by-step guide for making "The Best Real Estate Investment Nobody Knows About!" It is the exact plan I originated and it is written in plain English, so it will be a snap to understand and act upon. You don't need any prior education or experience. There is nothing else to buy. There are no expensive seminars to attend; no complicated computer programs to struggle with; no high-priced "hot lines" you must subscribe to. For just a few dollars the exclusive manual is yours and you will have everything you need to make a powerful move toward financial independence! "A New Life Changing Wake-up Call!" Let's get serious for a moment about you and your life. If you weren't thinking your life could stand some improving you wouldn't be reading this, right? Well, if have been looking for a life-changing event -wake up! This is it! By investing in this dynamic system, you will be investing in yourself. This new knowledge will give every one of your days new meaning. You will be climbing out of your daily rut. You will have new purpose, new ideas and new vitality. At last, you'll have something worthwhile to strive for. Your talents will come alive. You will begin racing toward financial freedom with valuable real estate investments! * You will begin to feel better, have more energy. * You will get along better with family and co-workers. * Your self-esteem will soar because of your accomplishments. * You will be admired for your new knowledge and achievements. * Your new attitude will welcome every problem as an opportunity. * People will seek your advice. * You will be able to provide your family with many of life's luxuries. * You will develop talents you were unaware of. * You will recognize unexpected opportunities. * People will be drawn to the "new" you. 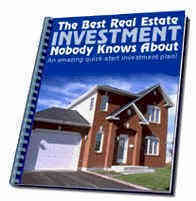 "The Best Real Estate Investment Nobody Knows About!" This knowledge can be the key that unlocks all of the good things that reside within you. It's all there. You just need to get to work at something interesting and profitable, so it can be released. And, here's the stunner - it's all done with brand new, perfectly located, modern rental homes! I want you to have this powerful system, so I have priced this unique manual for about what you would pay for a Tom Clancy novel! It's a small investment that has the power to change your life. How do you put a price on that? See? I take all the risk and no matter what happens we can still be friends. If you will order right now, with our secure, Internet order system, I will include a free copy of "Profits In Probates". This is a little known plan that explains how you can find bargains by shopping for investment homes in estates in probate. It's a clever plan for the person with a little extra time to spend looking for profitable investments. Some charge hundreds of dollars for this type of information. It's yours free if you order right now, on this visit! To insure that this is an offer you can't resist, here is another Free Bonus! If you order now I will include a free copy of "Hot Tips for Real Estate Investors!" This is my collection of powerful investing strategies that can be like gold in your investment plan. I recommend you read through this nifty manual once or twice every year, so you are reminded of all the powerful tactics. It has taken me years to collect these and they are yours free, but you must order now! "...and Still More Free Bonuses!" I realize that you don't know me and my track record, so you will have to overcome a certain reluctance when you make your investment in my system. I want to reward you for having the guts to do that. Bonus #3 - When you order I will welcome you as a member of the "Cash Flow Institute Investor Club"
Bonus #4 - You will be receiving by email "The Power Letter" Tips and techniques to help you make money! Bonus #5 - Plus, I will add your email address to the "CFI Investor Alert" list. From time to time I will send tips and alerts to keep you on track and motivated. Bonus #6 - You will receive periodic special offers and discounts. Bonus #7 - "Email Help Privileges". If you have a question or problem that you think CFI can help with, shoot us an email. We will do our best to find an answer. 3. "HOT TIPS FOR REAL ESTATE INVESTORS"